15:35 The Footsie held firm in late afternoon trade, bolstered by early strong gains on Wall Street as further US data painted an improving picture of the world’s biggest economy. After earlier hitting a one-week high, the FTSE 100 index drifted off that peak but was still up 29.6 points at 6,760.3 with just an hour to go until the close of trading. In New York, the Dow Jones Industrial Average jumped 111.7 points to 16,536.9 as further evidence of strengthening economic fundamentals in the United States came in the form of the smallest trade deficit in four years in November, as exports hit a record high. 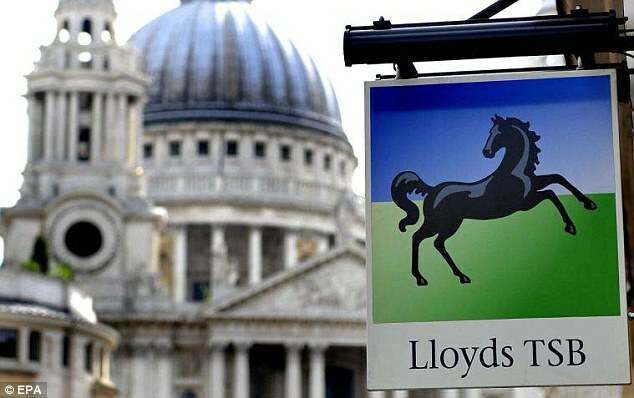 Banks wanted: Lloyds Banking Group led a rally by bank shares today on hopes an improving UK economy will boost lenders. Financial stocks led the advance in London, with Lloyds Banking Group a top blue chip gainer as investors bought the stock on expectations the part-nationalised lender will benefit from a recovering British economy and housing market. In a note to clients, analysts at Bernstein Research highlighted Lloyds as the top pure play on UK consumer growth, while it said taxpayer owned RBS looked promising on valuation grounds. Lloyds Banking shares added 2.4p at 82.6p, while RBS gained 5.4p at 349.7p. But going in the opposite direction, supermarket retailers were under pressure once again ahead of impending updates, with William Morrison the worst off today, down 3.8p at 252.5p. The food retailer, which reports its results later this month, suffered the most from news that German discounters Aldi and Lidl enjoyed a record Christmas trading period, as broker Barclays expressed some concerns about Christmas trading at Morrisons. ‘We very much doubt that Morrisons’ Christmas trading will deliver positive like for like, but the fourth quarter overall will benefit from the very weak comparisons in the final few weeks of the quarter. However, if our Christmas forecast is broadly correct then Morrisons may find it harder than it expected in November to deliver a positive like for like sales number for the fourth quarter – and there is a real risk that the company will have to step back from this commitment when it reports on 20 January,’ analysts at Barclays said in a note. Barclays equity strategists forecast lower sales for Sainsbury and Tesco, as well as Morrison. Sainsbury’s which issues a trading update tomorrow fell 2.3p to 365.5p. Tesco which posts its latest sales numbers on Thursday was steady at 333.3p after recent falls. And Barclays comments also weighed on Burberry, with the bank saying third-quarter sales at the luxury group – due on January 15 – ‘need to show strong comparable sales growth to retain confidence in the second-half forecasts’. Burberry shares shed 25.0p at 1,479.9p. 12:45: Strength in banking stocks fueled gains by the Footsie at lunchtime with the sector helped by fresh signs that the British economy is slowly recovering from the effects of the 2008 global financial crisis. After a tepid start today, by midday the FTSE 100 Index had pushed 30.9 points higher to 6,761.9 with the pace in the top flight set by Lloyds Banking Group which added 1.9p to 82.1p, while Royal Bank of Scotland was ahead 4.5p to 348.8p, and HSBC gained 10.3p to 670.3p. 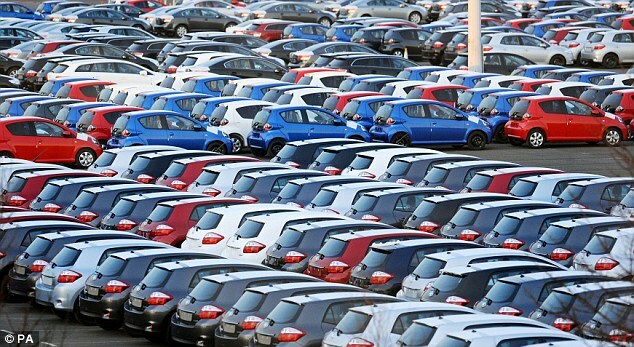 Data today showing that UK new car sales had hit a 5-year high and a British Chambers of Commerce survey that said UK businesses had reported strong growth and rising confidence in the fourth quarter of 2013 all helped provided reassurance on the British economy. Drive on: New car sales raced to a six-year high in 2013, the motor industry said today. ‘They’ve had a good run but I think there’s more to come, particularly as the economy picks up a little bit more,’ Cavendish Asset Management fund manager Paul Mumford said on the banking sector. Meanwhile retailers continued to fluctuate ahead of eagerly-awaited key festive trading updates from Sainsbury’s, Tesco and Marks & Spencer. Investors eyed some value in M&S shares following recent heavy falls caused by speculation that the company endured a poor festive period, with clothing sales seen down by as much as 1.5 per cent. The department store chain, which is due to publish its trading update on Thursday, rose 3.1p to 443.4p. But Sainsbury’s fell 2.4p to 365.4p after Bank of America Merrill Lynch cut its rating on the stock to underperform. The supermarket is expected to lose its record for underlying sales increases on Wednesday, with analysts pencilling in a decline after 35 quarters of growth in a row. Tesco was 0.3p lower at 331.85p, while Morrisons faded 3.6p to 252.7p ahead of impending updates. Supermarket retailers have been hit by losing market share to German rivals Lidl and Aldi, while clothing companies have had to contend with fierce competition on the High Street, with Debenhams issuing a profit warning in December. Equity strategists at Barclays today forecast lower sales for Sainsbury, Morrison and Tesco, and warned M&S could miss its gross margin target. Elsewhere in the top flight, some of the fizz in recent FTSE 100 newcomer Royal Mail faded after a City firm slapped a sell rating on the stock. Cantor Fitzgerald initiated coverage of the delivery firm with a warning that Royal Mail still faced significant challenges and that its current valuation and dividend were no longer compelling. Royal Mail shares have surged from their starting point of 330p in October to more than 600p in recent weeks, although they were 10.75p lower at 561.25p after today’s note of caution from Cantor. And shares in water company Severn Trent were also under pressure, falling 43p to 1661p, after JP Morgan highlighted fears that Ofwat may be tougher than expected on the sector in the current round of price negotiations. 10.45: The FTSE 100 has moved 25.6 points higher to 6,757.3, with some commentators putting this down to the US Senate vote approving Janet Yellen as new chief of the Federal Reserve. ‘Yellen’s confirmation as the head of the US central bank has put the markets at ease,’ says David Madden, market analyst at IG. ‘The new chairwoman is a safe pair of hands and, although she will not allow the markets to dictate her policies, she is unlikely to do anything too drastic in the early stages of her leadership. Ishaq Siddiqi, market strategist at ETX Capital, also said the confirmation of ‘dovish’ Janet Yellen as the next Fed chairman had buoyed market sentiment on the whole. 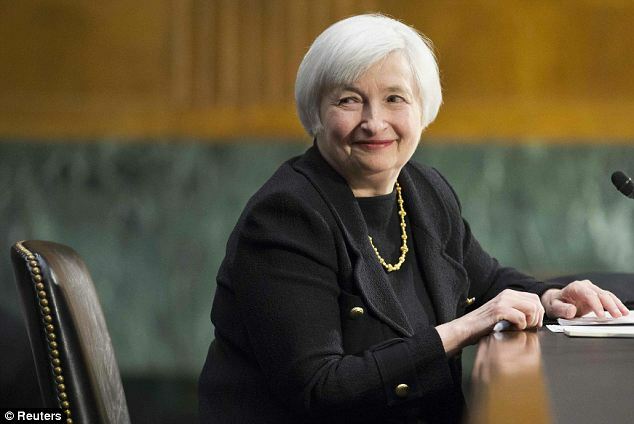 ‘She will be taking over Mr Bernanke’s role in the same dovish manner in which he leaves with the taper-ball now rolling. Yellen is a reputable and respected Fed member, sound forecaster and her area of expertise is engineering language/communication. Broadly speaking, so-called central bank ‘hawks’ worry more about the impact of the Fed’s stimulus policies on inflation, while ‘doves’ like Yellen are more concerned about combating unemployment. The London market has recovered from a poor start and made modest gains, but trading remains fairly lacklustre. The FTSE 100 has moved 12.5 points higher to 6,743.2, after it rose by just one point yesterday. Marks & Spencer and Sainsbury’s moved in opposite directions today as investors geared up for updates from the pair later this week. Marks & Spencer was the biggest riser in the top flight as investors eyed a buying opportunity following recent heavy falls caused by speculation that the company endured a poor festive period. The department store chain, which is due to publish its trading update on Thursday, rose 1.5 per cent or 7.25p to 447.5p. Sainsbury’s fell 5.5p to 362.3p after Bank of America Merrill Lynch cut its rating on the stock. The supermarket is expected to lose its record for underlying sales increases tomorrow, with analysts pencilling in a decline after 35 quarters of growth in a row. Topps Tiles highlighted the impact of a recovering property market as like-for-like sales rose 9.3 per cent in the 13 weeks to the end of the year. But homewares retailer Dunelm fell 41.5p to 937.5p, despite a 2.9 per cent improvement in underlying sales over the same period, a performance it described as robust. The FTSE 100 has dipped 5.4 points to 6,725.3, although firmer commodity prices are expected to help boost mining and energy shares today. Brent crude climbed to trade above $ 107 a barrel as cold weather across the central US threatened production, while key base metals prices rebounded after sharp declines in the previous session. The Footsie closed flat at 6,730.73 points yesterday after a choppy trading session, during which mining stocks fell following fresh signs of an economic slowdown in China. But Societe Generale’s European equity strategists backed the mining and oil sectors – the two worst-performing parts of the market in 2013 – arguing that concerns over a Chinese slowdown have been exaggerated and that oil stocks should benefit from rising production and free cash flow. ‘We recommend buying the laggards. Or maybe better still, loving what everybody else hates (oil, mining),’ they said. Alex Conroy, financial trader at Spreadex, suggested investors were cautious ahead of this Friday’s US non-farm jobs report, which he said could generate huge volatility if the outcome failed to support the Federal Reserve’s decision to start tapering its stimulus programme. He added: ‘Janet Yellen was last night confirmed as the new chairwoman of the Federal Reserve winning the vote 56-26, she will take over from departing chairman Ben Bernanke when he leaves on January 31. Jonathan Sudaria of Capital Spreads said: ‘The few trading sessions we have had this year have been quite choppy and whilst one could put that down to post-holiday low-volume sessions, there’s a lot of speculation about how this week’s data and central bank meetings will shape the tone of market sentiment. REED ELSEVIER: Anglo-Dutch information group Reed Elsevier named Nick Luff from British energy group Centrica as its new chief finance officer. EASYJET: The budget airline reported a 3.5 per cent rise in passenger numbers for December. British Airways’ parent company International Airlines Group reports passenger traffic numbers later in the day. AMEC: The engineering group said it had won a 255million contract with Kuwait Oil Company. TOPPS TILES: The tiling company reported higher sales. WINCANTON: The logistics company said it had won a contract with Argos. DUNELM: The homewares retailer posted a 2.9 per cent rise in second quarter like-for-like sales. ROYAL BANK OF SCOTLAND: A Japanese investment banking unit of Royal Bank of Scotland Group was ordered on Monday to pay a $ 50million criminal fine after pleading guilty to wire fraud over its role in manipulating the benchmark interest rate Libor. SHELL: Royal Dutch Shell, Austria’s OMV and Japan’s Mitsui will drill an exploration well off New Zealand’s southeast coast, becoming the latest group to search for natural gas in the country’s largely untapped deepwater basins. QE to infinity and beyond…..
How can Sainsbury’s profits be down. I was there shopping at 11pm before Christmas and they were absolutely buzzing.